The band performs throughout the UK and Europe in both concert and marching band formations and maintains the long traditions of the Yorkshire Volunteers adding a touch of pomp and circumstance to any event from traditional summer bandstand concerts to country shows with everything in between. The YV Fanfare Trumpets add a majestic touch at weddings with the Dixieland Jazz Band creating a party atmosphere at less formal functions, while the Dance Band "Yorkshire Swing" nostalgically recreate the big band era, the swinging sixties and beyond. The Corps of Drums appear in both scarlet tunics and 1940s battle dress for parades, beating the retreat and black light display. YV Brass provide music for dinner nights, receptions or anywhere a smaller ensemble is required. The band can trace it's history back to 1860 when it was formed as a volunteer corps in Leeds, West Yorkshire and now forms an integral part of the Yorkshire Volunteers Association. For more info visit the About the Band page. Ritchie Howard was born in Glossop in 1967. He started to learn the clarinet at the age of 14 and began his playing career with the Adamson Military Band. He attended University College Salford, where he studied performance and conducting under Roy Newsome, Elgar Howarth and Major Peter Parkes. He gained his Graduate Diploma in 1988. He then attended Bretton Hall College where he gained his Post Graduate Certificate in Education. In 1989 He joined Tameside Education Authority as a music teacher and was for 5 years Head of Expressive Arts at Hattersley High School. He was then promoted to Head of Music at Hartshead High School in Ashton - Under - Lyne. Ritchie is currently the Secondary Music Curriculum Leader for Tameside Music Service. In 1986, he began conducting community wind and brass bands and in 1993 enlisted into the Lancashire Artillery Volunteers Band as a clarinet and saxophone player. He was appointed Bandmaster of the Lancashire Artillery Volunteers Band in January 1997. He has conducted various bands on concert tours abroad including France, Germany, Holland, Ireland, Russia and Kuwait amongst others. In 1998, he was appointed Director of Music for the Keele University Concert Band. 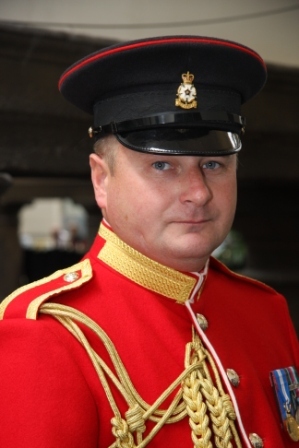 In April 2011 he was appointed Bandmaster of the Yorkshire Volunteers Band, which forms part of the Yorkshire Volunteers Regimental Association and is based in Wakefield, West Yorkshire.